This huge recreation area hosts millions of visitors a year on the two important lakes formed by Hoover and Davis dams, Lake Mead and Lake Mojave. Also, three of America's four desert ecosystems (Mojave, Great Basin, and Sonoran) meet at Lake Mead. Who knew the United States had four deserts? Even more impressive is that this seemingly barren area contains a remarkable number of plants and animals that are found in no other place. 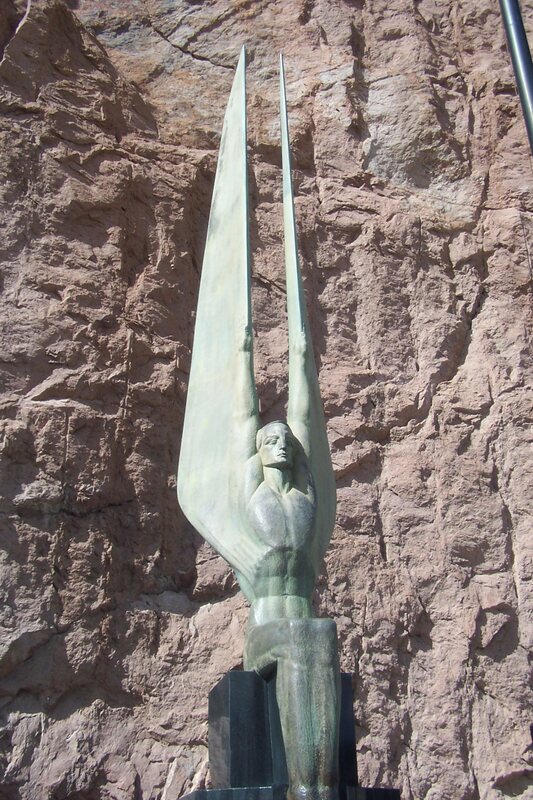 Of course, it wouldn't be nearly as interesting without Hoover Dam. The behemoth construction project was begun in the dark early days of the Great Depression, providing a spark of confidence during 1931 to 1935. The numbers are amazing: 3.25 million cubic yards of concrete were used in construction; the dam holds back up to 28.5 million acre-feet of water (nearly two years' normal flow of the Colorado River); it generates more than 4 billion kilowatt-hours a year, enough to serve 1.3 million people; and the $165 million dollar price tag of the dam's construction has been paid back, with interest, through the sale of its power alone. The base of the dam is 660 feet thick; the crest is 45 feet wide (enough for two lanes of traffic and a couple of pedestrian sidewalks). Before Hoover Dam was built, this area was sparsely populated. A few Native American groups made the area their home, and later, a few fur trappers, Mormon settlers, prospectors, and riverboat captains passed through in their various purposes. After the dam was built, however, providing an abundance of water and power, this area of the southwest began to grow and it hasn't looked back. 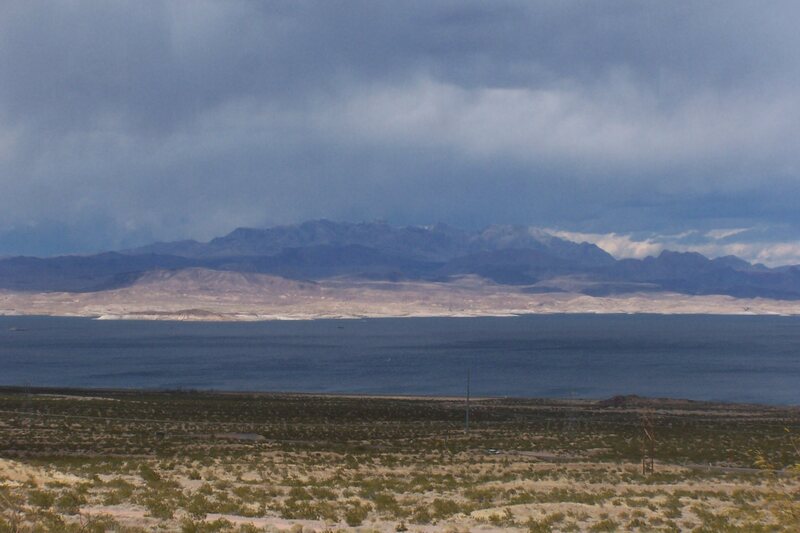 These two lakes, Lake Mead and Lake Mohave, provide nearly two hundred miles of coastline for vacationers. Swimming is allowed except where posted, boating and fishing provides excellent recreation, and canoeing, diving, hiking, picnicking and waterskiing are all popular. The park is open year-round, but the summer temperatures can be brutal, often rising above 110 degrees fahrenheit. There are plenty of sandy coves where you can park your boat and rest (or explore, or picnic, or camp). Many animals thrive in the desert of the Lake Mead and Lake Mohave area, including bighorn sheep, lizards, squirrels, jackrabbits, tortoises, hawks and other mammals. Joshua trees are well-represented, and winter showers can lead to springtime flowers of surprising variety and color. If you happen to be lucky enough to come across a Desert Tortoise, please treat it with respect. Although they appear tough and hardy, they do not respond well to human contact. These tortoises are a threatened species, likely to become endangered if the current trend continues. If you happen to come across one, please leave it alone! The only time you should touch a tortoise is if it happens to be on the road. In that case, pick it up carefully, take it off the road, and place it carefully down, preferably in a shaded area and in the direction it was going. Note that it is illegal to touch or bother a desert tortoise in Arizona, California, Nevada and Utah. When threatened, tortoises void their bladders, which is repugnant to predators. However, this also puts the tortoise in danger, as it relies upon that liquid during the heat of the day. So please, be kind to the tortoise. Daily tours of Hoover Dam are offered, but you ought to be aware of one important fact: Hoover Dam is not operated by the National Park Service, but by the Bureau of Reclamation. Indeed, the NPS has no visible presence at the Dam whatsoever. Want a stamp for your passport? Drive on four more miles to the Alan Bible Visitors Center (located on US 93). So, when you decide to explore Hoover Dam, don't expect the quality experience you'd normally find at a NPS site. I saw Hoover Dam and Lake Mead National Recreation Area during a four-site trip in springtime. The first item that caught my attention was that every vehicle that approaches the dam is subject to search. 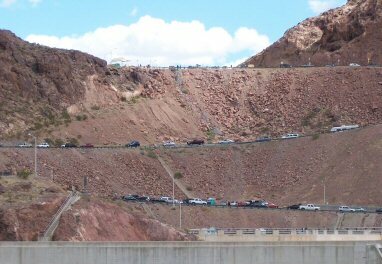 US 93 travels across the top of the dam, and ever since the events of 9-11-01, security here has been greatly heightened. Certain long vehicles, especially tractor-trailers, can't cross the Colorado River there at all, and must go south to Laughlin or northeast to Lake Powell. 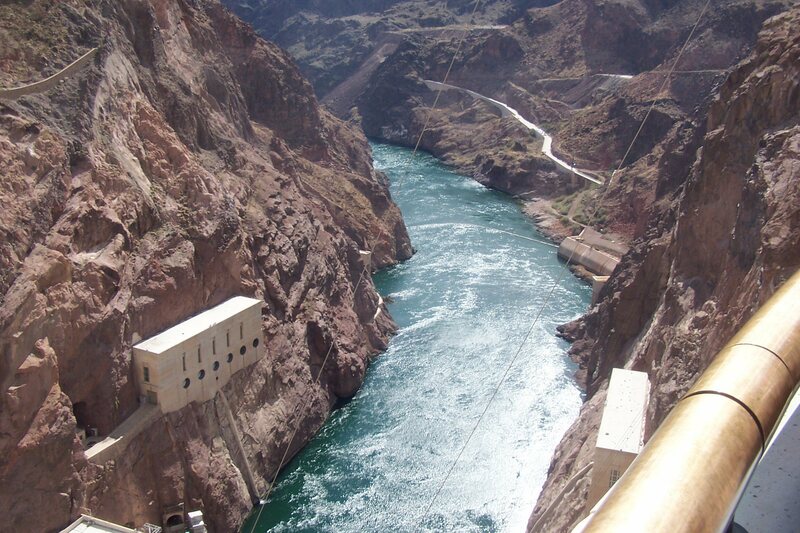 Check the Bureau of Reclamation website for more information on how best to cross Hoover Dam. Although I got across with a minimal wait, I was warned to expect delays of up to eight hours. Yikes! The good news is that a bypass bridge is under construction, and should be completed in 2008. We were able to stroll across the top of the dam, taking in both sides of the river. On the Nevada side are twin statues, "Winged Victory", which are a good example of expressive 1930's era progressive sculpture. The tour of the Dam is interesting, though abbreviated; the famous "hardhat" tour is no longer offered. Prices were $11 for adults and $6 for children, which is pricey considering what you get. No weapons are allowed, including pocketknives, Michael (he brought a pocketknife, but turned around before the security checkpoint). We enjoyed a short movie in a nice theater, before being herded into an overcrowded elevator for a trip to the middle of the dam. Note to those who suffer from claustrophobia: give heed to the warnings posted before you buy your tickets for the tour. Our tour group was large, and the elevator was truly crammed with people. Cameras poked me in the back, kids were swallowed up. When one lady with a stroller said apologetically that she would take the next elevator, she was curtly informed "there is no next elevator". 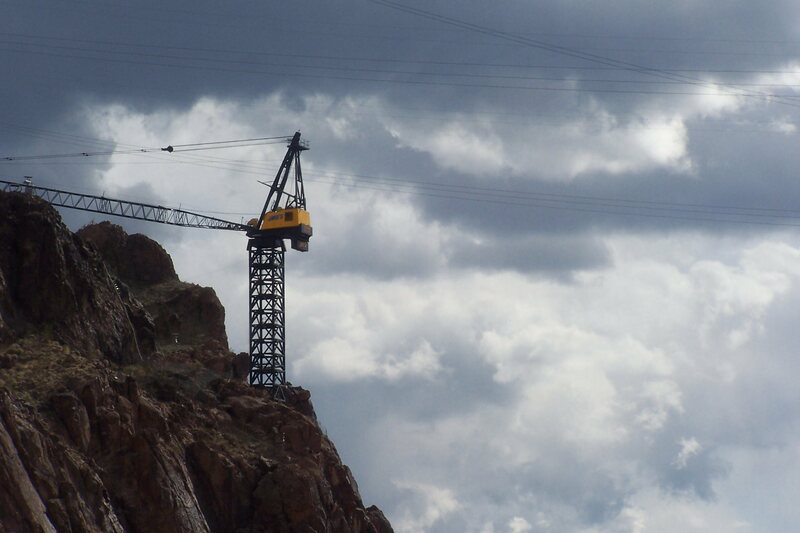 She got on, and we descended over 500 feet into the bowels of the dam in about a minute. Immediately upon exiting the elevator, we walked through a long rough rock-hewn corridor of maybe 150 feet to the generator room. As we walked, we saw water oozing from the walls, trickling to gutters by our feet. This is a known and expected phenomenon, but still it's a little disconcerting to those already a little nervous, Gina. The generator room was very impressive. 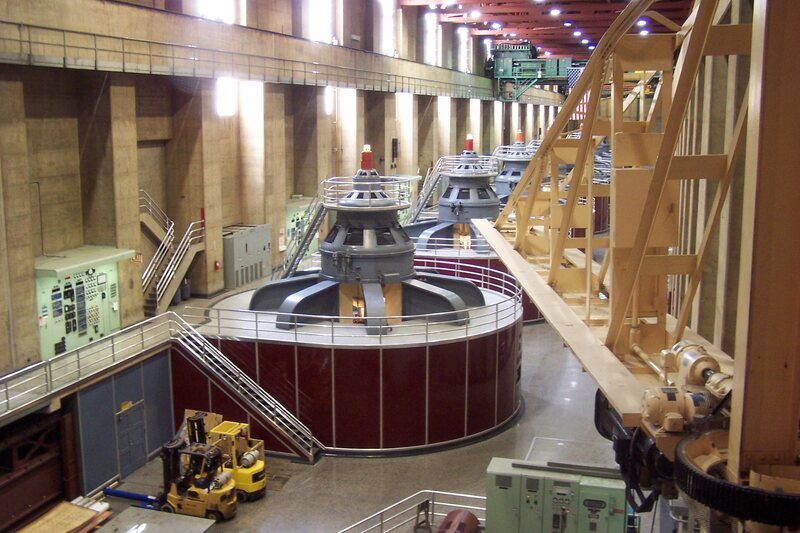 Nine massive turbines spin thousands of times a minute as water from behind the dam rushes through, providing electricity for the cities of Las Vegas and Phoenix, among others. The tour ended up on top of the dam, offering great views of the downstream Colorado. We were left to find our own way back to the main part of the dam. Had I never experienced the high quality of NPS personnel, I would have said the tour was just fine. However, because it is run by the Bureau of Reclamation, I shouldn't compare it to the typical top-notch NPS presentation. The Alan Bible Visitor Center, three miles past the dam on the Nevada side, four miles from Boulder City, is a decent Center. The Park Ranger on duty was helpful, as expected. The Center offers a good view of the lake from a spot next to the restrooms; a better view is found between the dam and the Center, at appropriately called Lakeview Overlook. Unfortunately, I missed it as I drove. By that time of the afternoon, about 3:00 p.m., traffic Arizona-bound was horrific and I was not about to turn around. Many guided hikes are offered by the National Park Service during the spring. Call (702) 293-8990 for more information. There is a Junior Ranger program offered for the kids. There are several marinas that access the river and the two lakes. Beware underwater obstructions as you boat around, for Lake Mead is a fluctuating reservoir with changing lake levels. Currently (2006) the lake level is lower than in past years, and obstructions that were too far underwater to be a problem in earlier years are now a problem again. The main visitors center is a few miles north of Boulder, Nevada. 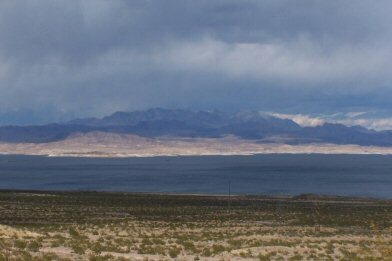 Lake Mead can be accessed from either Nevada or Arizona. From Las Vegas, take I-515 southeast (also marked as US 95/93) toward Henderson, and continue on US 93 to Boulder City, a total trip of about 25 miles. Follow the signs to Hoover Dam. 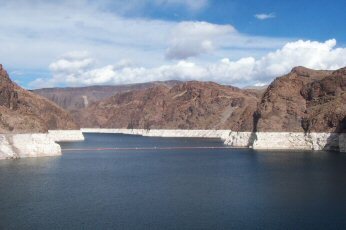 Davis Dam and Lake Mohave are just a couple of miles north of Bullhead City, Arizona, and Laughlin, Nevada. To examine the rest of the NRA from those towns, take US 95 north toward Henderson, and turn off to the right any place you'd like. Directly east you'll find Grand Canyon National Park and Grand Canyon-Parashant National Monument. Close by, to the southwest, lies Mojave National Preserve. About 100 miles northwest is Death Valley National Park.